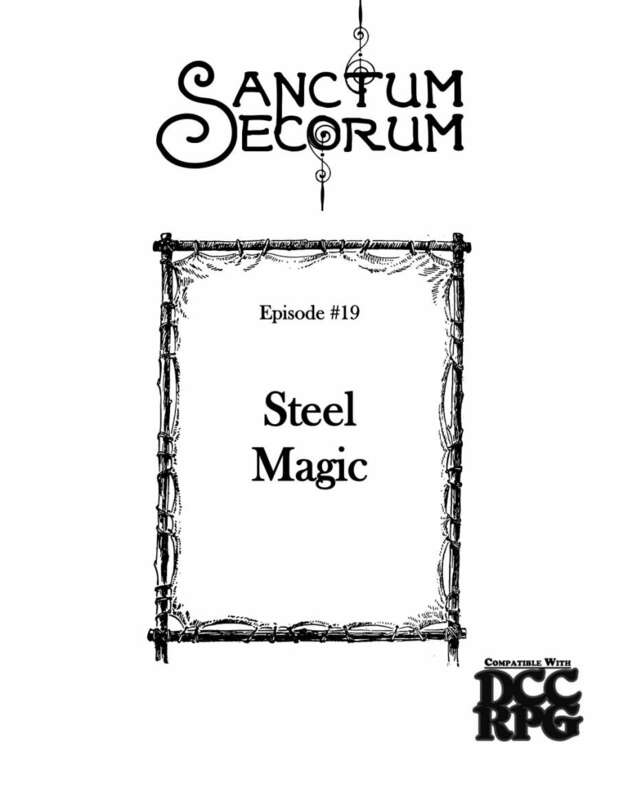 The Sanctum Secorum Episode #19 Companion: Steel Magic was written by David Baity, Bob Brinkman, and Jen Brinkman. Additional concept by Ethan Nicholle. Art is by Autar, Frozen Stocks, livliv1719, Paula Darwinkle, Samuel Silva, and Bearmageddon News Network. The publisher is Sanctum Media. This product is produced in association with the Sanctum Secorum podcast. 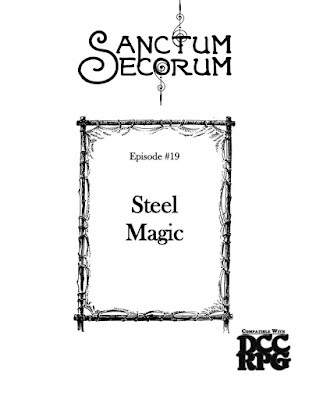 This Episode Companion is based on Sanctum Secorum Episode 19: Steel Magic, which discussed the novel by Andre Norton. The featured adventure was Glipkerio’s Gambit by Jobe Bittman. Disclosure: An adventure I wrote, Prince Charming, Reanimator, was discussed in this episode. Grizzly Boar: "The horrific creation of science gone awry, the grizzly boar is a near unstoppable engine of destruction. Capable of razing entire villages, this monstrous behemoth is a match for all but the greatest of heroes. The first encounter with the creature lead to the deaths of a seasoned group of hunters, fully prepared and armed to the teeth for their encounter. The grizzly boar destroyed them, impaling them with its mighty tusks and laying waste to the entire hunting preserve. Now the creature is at large and may be encountered by unwary adventurers." This creature, which is not from the featured novel, was given Dungeon Crawl Classics statistics by Bob Brinkman, from a concept by Ethan Nicholle. Guardian Fox: A magical protector of enchanted woods, this time from Steel Magic, given stats by Bob Brinkman. Horse of the Hills: A race of flying horses from Steel Magic. Write-up is by Bob Brinkman. Spider, giant (Mushroom Spider): Pack-hunting spiders, which appear to be lumps of fungi when they are not moving. This version of the creature was written by Bob Brinkman. Spider, giant (Spider-cap): And this is another version of the same basic creature, from Steel Magic, by David Baity. This version has been modified to dwell in those caverns and dungeons that PCs are likely to explore. The Witch of the Mountains: "Some refer to her as the blight of the land, the reason Arthur has hidden, the thing keeping the sword in the stone. Some know her as Merlin’s nemesis. Very few Avalonians will speak her name — Merlin among them." The Witch is given Dungeon Crawl Classics statistics by Jen Brinkman. Witch-Web: This is a 3rd level wizard spell, written by Bob Brinkman. "The caster weaves several hairs from her head together to form a small mesh which is then thrown at the target as part of the casting (no attack roll is required)."